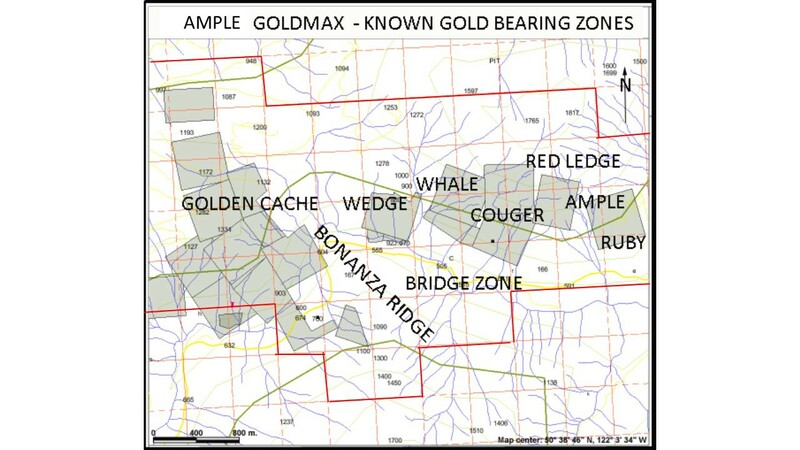 Cardston, Alberta--(Newsfile Corp. - August 13, 2018) - American Creek Resources Ltd. (TSXV:AMK) ("the Corporation") is pleased to report that 2018 exploration has commenced on the Ample Goldmax gold property located within the historic gold camp area near Lillooet, British Columbia, Canada. The Corporation had originally planned to carry out this program last year however, at that time access to the property was restricted due to forest fire danger in the area. The 1,044 hectare Ample Goldmax property is located approximately 8 km west of Lillooet along, and adjacent to, Highway 99 South along Cayoosh Creek. The property has a long but intermittent history of gold prospecting dating back to 1866 when coarse placer gold was discovered in the lower reaches of Cayoosh Creek. Abundant placer mining lead prospectors upstream to multiple sources of lode gold including what became the historical Ample and Golden Cache mines. The property hosts multiple zones of high-grade native gold-bearing quartz veins. These gold showings are located mainly along a 3 to 4 km extent of the Cayoosh Creek Fault in Cayoosh Assemblage rocks. Complete delineation of mineralized zones along this trend has never been undertaken, although sporadic past exploration has shown the presence of multiple gold-bearing mineralized zones. The Ample Goldmax claims area demonstrates an excellent exploration target in the search for an economic deposit of gold. All areas are open to potential expansion and new discovery. The objective of the present program is to locate and map known gold structures, to prospect for new gold veins, and to define future drill locations targeting high grade gold vein systems. The Corporation is pleased to report that this new 2018 program has already resulted in the discovery of visible gold within the first surface quartz vein system examined. Two past producing mines are located within the property. The first was the Golden Cache in 1887, which produced spectacular native gold specimens, but only slightly over 1,000 tons of ore was ever mined. The Ample Mine, which operated on and off from 1900 to the 1930's, was the most significant in the area, with at least eight different adits and approximately over 300 meters of underground workings. Historical work on the property by Homestake included the mapping of eight underground workings and also the identification of at least 10 known mineralized zones over a strike length of 3 km primarily hosting native gold, with or without sulphides, in mesothermal quartz vein stockworks, gold and various amounts of silver in sulphide zones, and areas with lower grade bulk tonnage disseminated type gold. Homestake conducted a small diamond drill program in 1996 and reported several intersections of gold at shallow depth including 11.76 g/t over 8.2 meters which included 1.2 meters of 66.84 g/t gold (containing visible gold) and another intersection of 21 meters of 2.75 g/t gold (December 16, 1996 Aris Report 24742). A report prepared for Homestake by Kuran and McLeod (1997) reports that grab samples returned up to 118 g/t gold with surface chip samples up to 6.9 g/t gold over 3 meters. CEO and President, Darren Blaney stated: "We are pleased to finally be able to start working on the Ample Goldmax property as wildfires prevented our work program last year. The Ample Goldmax is an incredibly prospective property located in a historic gold district with past placer and hard rock production and numerous high-grade gold zones. The discovery of visible gold on the first day was a great start to the program." To learn more about the Ample Goldmax property please click here. American Creek holds a strong portfolio of gold and silver properties in British Columbia. The portfolio includes three Golden Triangle gold/silver properties; the Treaty Creek and Electrum joint ventures with Walter Storm/Tudor as well as the 100% owned past producing Dunwell Mine. Other properties held throughout BC include the Gold Hill, Austruck-Bonanza, Ample Goldmax, Silver Side, and Glitter King. Certain statements contained in this press release constitute forward-looking information. These statements relate to future events or future performance. The use of any of the words "could", "intend", "expect", "believe", "will", "projected", "estimated" and similar expressions and statements relating to matters that are not historical facts are intended to identify forward-looking information and are based on the Corporation's current belief or assumptions as to the outcome and timing of such future events. Actual future results may differ materially. All statements other than statements of historical fact included in this release, including, without limitation, statements regarding potential mineralization and geological merits of the Treaty Creek Project and other future plans, objectives or expectations of the Corporation are forward-looking statements that involve various risks and uncertainties. There can be no assurance that such statements will prove to be accurate and actual results and future events could differ materially from those anticipated in such statements. Forward-looking statements are based on a number of material factors and assumptions. Important factors that could cause actual results to differ materially from the Corporation's expectations include actual exploration results, changes in project parameters as plans continue to be refined, results of future resource estimates, future metal prices, availability of capital and financing on acceptable terms, general economic, market or business conditions, uninsured risks, regulatory changes, defects in title, availability of personnel, materials and equipment on a timely basis, accidents or equipment breakdowns, delays in receiving government approvals, unanticipated environmental impacts on operations and costs to remedy same, and other exploration or other risks detailed herein and from time to time in the filings made by the Corporation with securities regulators. Although the Corporation has attempted to identify important factors that could cause actual actions, events or results to differ from those described in forward-looking statements, there may be other factors that cause such actions, events or results to differ materially from those anticipated. There can be no assurance that forward-looking statements will prove to be accurate and accordingly readers are cautioned not to place undue reliance on forward-looking statements.